Made for TV. Comedy. 01 Dave B's must sees. Recommended. Written by and starring stand up comedian Sean Lock, this is a delightfully misanthropic view of the world observed from the giddy heights of a South London tower block. Vince is a small minded, mean spirited loser, fortunate only in that life continues to offer up individuals, like his new flatmate, Errol, even more hopeless than he is. 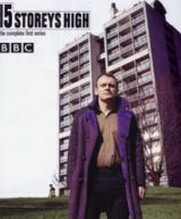 Petty, surreal, ridiculous and considerably closer to reality than the vast majority of sitcoms, '15 Storeys High' is a sharp, funny, ugly little myopia. British comedy is still rockin' (oohps, that's probably doomed it).